Neuro-Linguistic Programming (NLP) is the study of excellence that focuses at identifying communication and behaviour to produce a state of excellence. Within this training, you will learn how to use techniques with yourself and others. This course will run next on 23rd to 27th March 2019. Learn a skill set that will assist you in all aspects of life to create the life you desire. NLP Practitioner Strategies – Strategies to learn and modify your mental sequence of internal processes to create specific result. 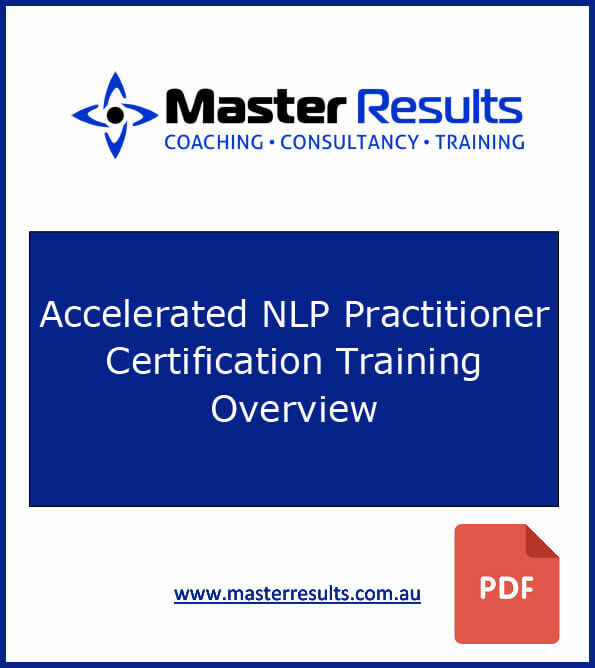 Click here for a full detailed outline of NLP Practitioner Course Content. Talk about having my eyes opened wide, when I completed NLP with Sara from Master Results! Initially, I enrolled due to learning of the ‘5 Step Sales Process’, as I had heard it had helped a lot of my peers in their business development roles. So, quite green I signed up to this LIFE CHANGING course and was introduced to a multi-faceted language of the mind!! Sara is so engaging, as she takes your hand and leads you through, to the point of revelation! I urge anyone to take the time and do this course, as you certainly will master your life, and create your own results!! !